In 2007, the California Ocean Protection Council initiated the California Seafloor Mapping Program (CSMP), designed to create a comprehensive seafloor map of high-resolution bathymetry, marine benthic habitats, and geology within the 3-nautical-mile limit of California’s State Waters. The CSMP approach is to create highly detailed seafloor maps through collection, integration, interpretation, and visualization of swath sonar data, acoustic backscatter, seafloor video, seafloor photography, high-resolution seismic-reflection profiles, and bottom-sediment sampling data. The map products display seafloor morphology and character, identify potential marine benthic habitats, and illustrate both the surficial seafloor geology and shallow (to about 200 m) subsurface geology. Tomales Bay, approximately 20-km long and 1- to 2-km wide, formed along a submerged portion of the San Andreas Fault, which forms a right-lateral transform boundary between the North American and Pacific tectonic plates. The fault juxtaposes Cretaceous granitic rock to the southwest (exposed on Tomales Point) with the Jurassic and Cretaceous Franciscan Complex to the northeast (exposed on the northeast coast of the Tomales Bay), and has an estimated slip rate of about 17 to 30 mm/yr in this area. The destructive great 1906 California earthquake (M7.8, 4/18/1906) is thought to have nucleated on the San Andreas Fault about 60 km to the south, offshore of San Francisco, with the rupture extending northward through Tomales Bay and for an additional about 230 km to the south flank of Cape Mendocino. The northwest coast of Tomales Point is characterized by steep, high (as much as 100 m), barren, granitic cliffs and a rugged shoreline with a few small pocket beaches. There has been as much as 48 m of Tomales Point cliff retreat from 1929–30 to 2002. The granite is overlain by less resistant Tertiary sandstones at Kehoe Beach, the northern end of a continuous, wide, sandy beach backed by a large coastal dune field that extends for about 20 km south to Point Reyes Head. This long beach has a mixed history of accretion and retreat since the late 1800s. Tomales Point relief is asymmetrical so that most small coastal watersheds in the map area drain eastward from Inverness Ridge into Tomales Bay. Many of these steep drainages have small sandy beaches at their mouths. The east coast of Tomales Bay is characterized by more gentle, hummocky, hilly relief underlain by the landslide-prone Franciscan Complex. Keys Creek, the most prominent small watershed entering Tomales Bay from the east, has a small subaqueous delta at its mouth. Central Tomales Bay is relatively flat and underlain by fine sand and silt. The mouth of Tomales Bay is characterized by sand waves, dunes, and flats that have formed in response to strong tidal flow. Sand Point and Dillon Beach are located at the mouth of Tomales Bay and on the southeasternmost shores of Bodega Bay, respectively. The wide beach in this area is backed by an extensive (4.8 km2) sand-dune complex. The enormous volume of sand on the beach and in the dune field is derived from southward littoral drift. This sediment is trapped by Tomales Bay and Tomales Point, which function as the south end of the Bodega Bay littoral cell. The continental shelf in California’s State Waters in the Offshore of Tomales Point map area extends to water depths of about 70 m (mean slope of about 0.7°) and is characterized by extensive, rugged, rocky seafloor. Granitic seafloor has a massive and fractured texture, whereas seafloor sedimentary rock outcrops commonly form distinctive “ribs” created by differential seafloor erosion of dipping beds of variable resistance. Direct sediment supply to this shelf is minimal because littoral drift is blocked to the north by Tomales Bay and Tomales Point, and to the south by the Point Reyes headland. Circulation over the continental shelf in the map area (and in the broader northern California region) is dominated by the southward-flowing California Current, the eastern limb of the North Pacific Gyre. Associated upwelling brings cool, nutrient-rich waters to the surface, resulting in high biological productivity. The current flow generally is southeastward during the spring and summer; however, during the fall and winter, the otherwise persistent northwest winds are sometimes weak or absent, causing the California Current to move farther offshore and the Davidson Current, a weaker, northward-flowing countercurrent, to become active. As a result, net flow over the continental shelf can be more southerly during the spring and summer and more northerly during the fall and winter. Throughout the year, this part of the central California coast is exposed to four wave climate regimes—the north Pacific swell, the southern swell, northwest wind waves, and local wind waves. The north Pacific swell dominates in winter months (typically November through March), with wave heights at offshore buoys ranging from 2 to 10 m and wave periods ranging from 10 to 25 s. During summer months, the largest waves come from the southern swell, generated by storms in the south Pacific and offshore Central America. Characteristically, these swells have smaller wave heights (0.3 to 3 m) and similarly long periods (range 10 to 25 s). Northwest wind waves affect the coast throughout the year, while local wind waves are most common from October to April. These two wind-wave regimes typically have wave heights of 1 to 4 m and short periods (3 to 10 s). Potential marine benthic habitats in the Offshore of Tomales Point map area range from unconsolidated continental-shelf sediment, to rocky continental-shelf substrate, to unconsolidated estuary sediments. Rocky-shelf outcrops and rubble are considered to be promising potential habitats for rockfish and lingcod, both of which are recreationally and commercially important species. Dynamic bedforms, such as the sand waves at the mouth of Tomales Bay, are considered potential foraging habitat for juvenile lingcod and possibly migratory fishes, as well as for forage fish such as Pacific sand lance. 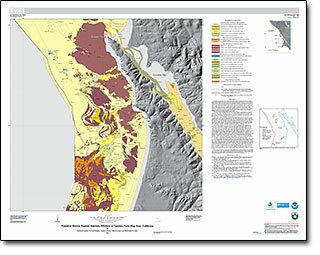 Open-File Report 2015-1041, California State Waters Map Series—Drakes Bay and Vicinity, California, by Janet T. Watt and others. The GIS data layers for this map are accessible from “Data Catalog—Offshore Tomales Point, California,” which is part of California State Waters Map Series Data Catalog (Data Series 781). The links below will take you there. Data Catalog—Offshore Tomales Point, California. Each GIS data file is listed with a brief description, a small image, and links to the metadata files and the downloadable data files. Johnson, S.Y., Dartnell, P., Golden, N.E., Hartwell, S.R., Greene, H.G., Erdey, M.D., Cochrane, G.R., Watt, J.T., Kvitek, R.G., Manson, M.W., Endris, C.A., Dieter, B.E., Krigsman, L.M., Sliter, R.W., Lowe, E.N., and Chin, J.L. (S.Y. Johnson and S.A. Cochran, eds. ), 2015, California State Waters Map Series—Offshore of Tomales Point, California: U.S. Geological Survey Open-File Report 2015–1088, pamphlet 38 p., 10 sheets, scale 1:24,000, https://dx.doi.org/10.3133/ofr20151088.